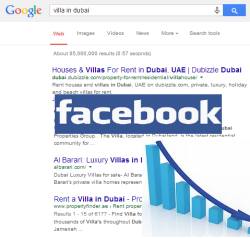 We know that since 2012 Facebook has reduced the organic reach of branded pages to 16%. This was further reduced to about 12% in December 2012. An analytic study of more than 100 brands’ Facebook pages has found that organic reach has reached an all-time low of 6.15%. This figure is going to keep falling until it hits rock bottom with zero organic reach. For brands with more than 50,000 likes, the current organic reach status is around 2.11% as compared to the 4.04% in October 2013. 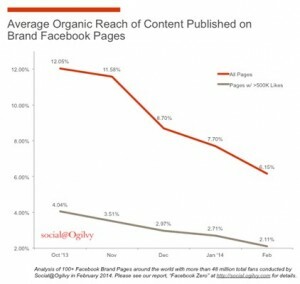 Marketing and digital experts are predicting that it is only a matter of time before organic reach of the content that brands publish on Facebook hits zero. Digital and Online brand marketers have always relied on Facebook’s ability to build communities, maintain relationships and engage in meaningful communication. Many corporations and brands have invested millions of dollars in developing Facebook communities with meaningful and valuable content. Now that the days of getting free reach on Facebook is numbered, online marketers need to rethink their digital networking strategy. Decisions have to be made concerning content, audience and most importantly about budget. Less publishing will result in content becoming more streamlined and effective. The audience will be properly targeted rather than a random one. The always-one status will focus on Twitter or Instagram rather than Facebook. The path forward for businesses on Facebook is through Paid Ads. According to Moz Blog, all you need is to spend $1 per day on Facebook to get access to 4,000 people who were otherwise unaware of your existence.